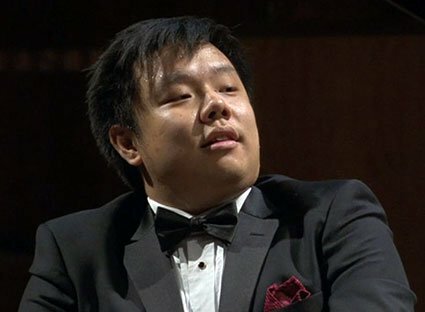 The recital that pianist Larry Weng played as part of the Foundation for Chinese Performing Arts Series Tuesday evening at the Walnut Hill School was unusual in any number of ways, mostly undramatic and lower-case. Thankfully lacking Chopin and Schubert chestnuts, it leaned heavily on Busoni. Who begins with serious protein such as the four Brahms Ballades? The 29-year-old gave them with straight, unadorned, and enthusiastic integrity, probing while also refreshingly human. I found it stirring, too, not only highly gratifying musically, and will seek to hear Weng in the future. One device Weng employs, perhaps overdoing it, is Romantic split attacks, playing one hand milliseconds before the other. It’s effective for ringing out melody and suchlike, and seemed implemented here, maybe half of the time, always deftly and unobtrusively. Weng naturally doesn’t do it when he thinks the music doesn’t call for it and wants the hands perfectly together. I found it all a bit much. The Ravel Sonatine featured the featheriness and washed colors that such repertory needs. I suppose I was still in thrall to Brahms. Busoni’s Variations on a Theme of Chopin (the C-minor Prelude) is a wild thing, running all over the keyboard, differently per variation, then a monster of a fugue, succeeded by tinkling salon sprinkles, the whole underpinned throughout by what looked like the most difficult pedaling. It sounded rather often like a mean treatment of Chopin. Weng negotiated the insanely difficult measures just fine, without flash—the clear result of labor. The second half comprised the main plates, Beethoven Opus 109 and the Bach Toccata, Adagio, and Fugue in C S.564 as pianoed by Busoni. Both of them had knockout climactic moments where Weng worked his thrilling textural magic in congested passages, all with unflagging drive—the guy is rhythmically incisive without fail. Both also had a moment where fingers and memory slightly derailed, not something you hear every day from a pianist of this intellectual caliber. You could tell from Weng’s wry smile afterward that he might have relished a do-over, also acknowledging that’s how it goes sometimes. The Beethoven’s lovely opening tune began too fast, but soon enough came to achieve intermittent aplomb, and, by the great variations of the final movement marked “Cantabile, with the most expressivity”, achieved nobility and real force. Beethoven summons his usual late-period shapeshifting and timeshifting here, accelerations within the same tempo and so on. The usual Beethoven potency eventually drives unto monumentality and fullness of keyboard register; the last variations reach an effect, Wilfrid Mellers notes, “more terrible and awe-inspiring than beautiful”. A prior variation has been a stricken waltz, and soon a chase of scales under and over the theme. Weng showed high sensitivity again in thick textures, where brief fugality breaks forth, where Beethoven weaves a gorgeous strand mostly but not totally underneath darker cloth, where even the cross-rhythms get congested, where the pinged theme struggles against, then rises above, a dense rumble. Best of all, Weng’s right pinky on those final pages banged and clanged and loudly rang, exactly the way (says me) that we expect the pianist to do to the themes of all three of the late sonatas, as they round, or drive, or float toward home. Many brand-name pianists underplay, even miss that. Not Weng. The Bach was even better. That again there was a passage which momentarily went off the tracks didn’t matter. The Toccata is goofy writing, the Fugue nearly so. The Adagio is so profound that in piano form it stands among the famous somber chorale arrangements, its chromatic suspensions—the learned musician just could not produce enough of those when in the mood—sobering the soul, every time. Weng showed much variety of touch, yet the outstanding impression was of strength and purposeful energy navigating Bach’s crowded rhythms and mobile harmonies with motivated purpose. So much of Bach’s keyboard power comes from the working-out, then the reworking, of the material. Weng gets this point fully, and again played with such digital evenness that new lines evoked interior chambers newly lit. Weng’s handiwork is not as technically immaculate as so many prodigies’ these days, and he’s unafraid to show sweaty work, although he actually dispatched most of the most complex passages without flaw. Walnut Hill’s small and rather unresonant new Delbridge Recital Hall sounds at once hard and dry, leaving some unanswered questions about instrument colors, though affirming Weng’s wider and more delicate than usual dynamic range. His understanding intelligence, and his even, penetrating voicing mark him as a considerably more impressive and rewarding pianist than most. He encored with a loving, almost ravishing rendition of “Sheep May Safely Graze”.